The future of architectural visualization has close ties with real-time rendering and most of the marketing is shifting to that technology. You will see a lot more people choose Eevee instead of Cycles in the coming months and the popularity of solutions like the Unreal Engine is a great indicator of that fact. If you are already working with real-time rendering for architecture with the Unreal Engine, I found a free resource that might help you with architectural projects. Even if you model your project in Blender to later export for the Unreal Engine, a lot of the materials and textures for your project will come from the Unreal Editor. For materials like Glass, you will have to set up everything in the Editor to use in architecture. Do you want to download a pack with more than 35 free glass materials for the Unreal Engine? By visiting this link in the Unreal Marketplace you will be able to download the pack at no cost. 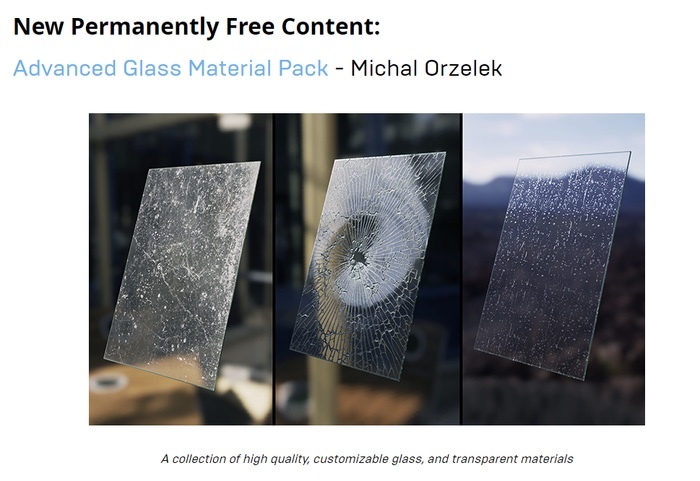 Just a couple weeks ago the glass pack was a paid asset, and the author Michael Orzelek decided to give it away for free! Can I use all the materials for architecture? Not all of them will help you with architecture because some of them include shaders for shattered glass and others that will work for game development instead of architecture. But you will also find see-through transparent glass and variants. Blender is a great companion to the Unreal Engine because despite all the power to produce real-time architecture you can do any 3D modeling with the Unreal Editor. You can make your models in Blender and send them to the Unreal Engine as a workflow.